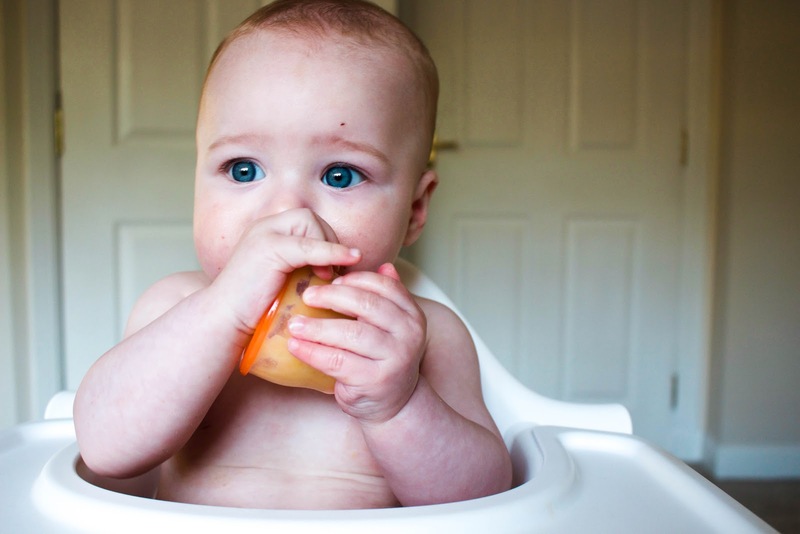 Weaning with your first child can be a bit of a minefield. With so many options, so many opinions and no experience to fall back on, it's easy to fall into the trap of buying pre-packaged pouches after pre-packaged pouches. I did, for the first 3 months, until I discovered the Vital Baby 2 in 1 Steam and Blend and realized I was throwing away money every single week when there was a simple solution. 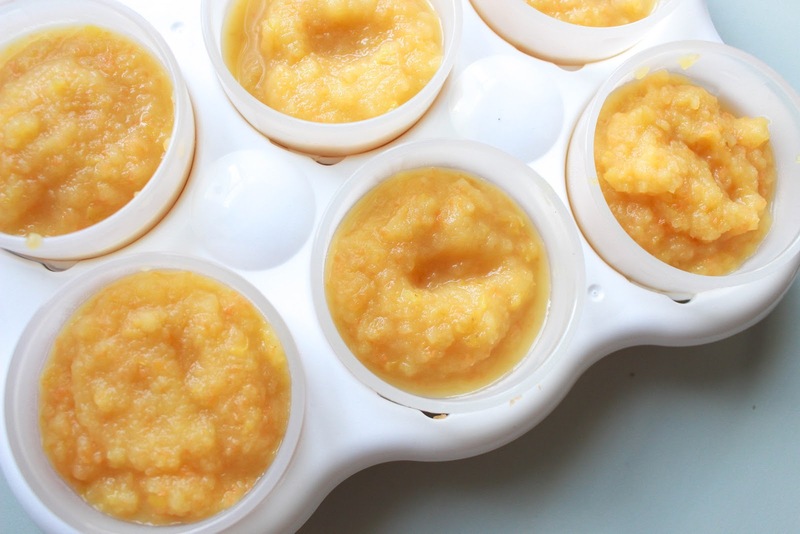 From the moment we began to think about weaning (around 3 months) - I claimed I'd be making my own baby food. I had the expectation that my freezer would be filled with blended down concoctions, all day every day. The reality of life with a baby however saw me using the 'I don't have time' excuse daily, and despite having a traditional blender ready and waiting, I never did use it - I was completely reliant on the pre-packed baby food pouches I picked up at Tesco, and they worked well for me. I still use them now, but the majority of my seven month old's food now comes as a direct result of my own culinary skills (well, that of my special blenders). 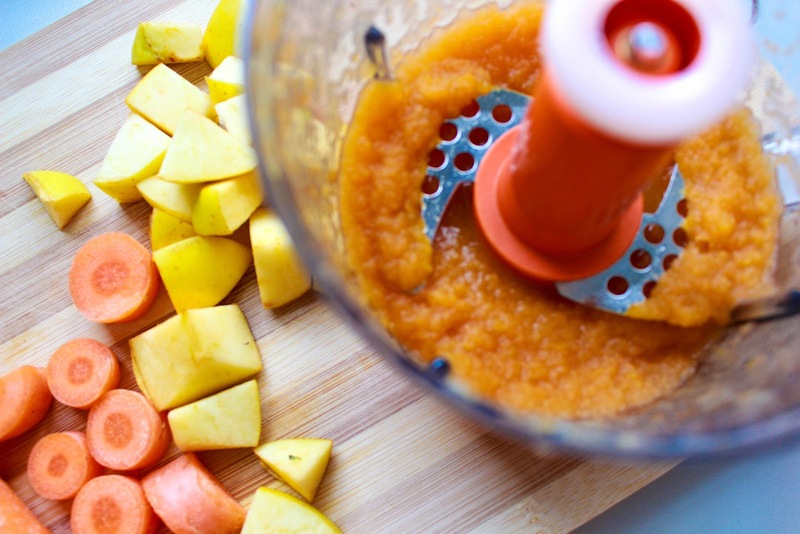 The Steam and Blend was supposed to make life easy - and this was what finally brought me round to the idea of making my own baby food. Pureeing fruit and veg is not complicated (even without a steam blender) but it is something I put off when starting weaning because I thought it would be time consuming and complicated. Turns out, it's not. The Steam And Blend is one machine with the options to Steam, Blend or Steam and Blend in the same bowl - thus reducing the washing up required. There really isn't much to it: a product that I initially found intimidating is one that really couldn't be easier to use. To put it simply, you chop your chosen ingredients (in my case whatever I can find in the cupboards from last weeks shop) into smaller more manageable chunks, put them all into the bowl, and press start. You can alter the time in 5 minute segments and these display in a countdown on an LED display (handy for us impatient cooks), but 15 minutes is generally about right for me as I am only ever steaming fruit or vegetable. As with any product, there are downsides if you look for them. I only mention this for the sake of a balanced review, but the reality is, spending £79.99 at once may seem like a bit of an excessive expense for weaning. Price is something that can be off putting initially, but if you do the math, if you are spending £25 a week on pre-packaged purees, it would not be long before you make the money back creating your own. 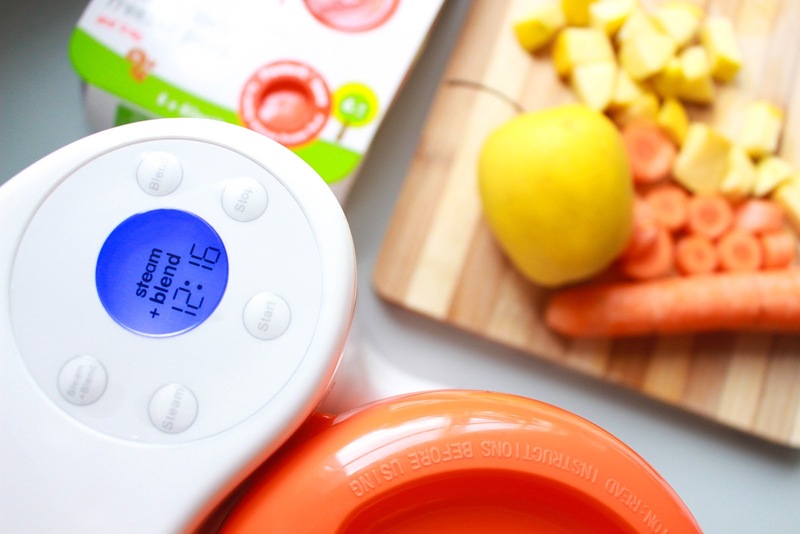 There is also nothing to say that the Steam and Blend is limited to baby food and baby food alone - it's multi purpose, and there is no doubt in my mind I'll be getting my moneys worth. It goes without saying the machine is also very warm at the end of the process, but that can only be expected with a product that steams food. It cools very quickly, and the machine itself turns itself off after it is finished which is such a handy feature - although in theory I thought I'd never use it, I've lost count of the times I've now thrown in some fruit and veg into the Steam and Blend before leaving the house in the morning, happily knowing I will return to a standing house and not the remnants of a house fire. When I returned to work this month, I'll put my hands up and say I thought my puree making days were once again behind me. I had resigned myself to the fact that after working a 42 hour week, the last thing I'd want to do was make purees when I got home. In my first week of work haze, I found myself running out of purees, and ended up stuck in rush hour traffic to buy some. In my second, there were no offers on in Tesco, and I spent £28 on packets of mush alone. By the third, my Vital Baby was back. For the sake of a twenty minute cycle, I had prepped an entire week of food, all of which I knew was healthy and nutritious. I hadn't spent money on the over-indulging packaging, I didn't have to make a mad dash to the shop, and I really didn't have to exert myself. These were my back ups; we've been blending our own dinners for Harrison, but on the off chance dinner is a spicy korma, our brocolli and pear concoction are at hand. 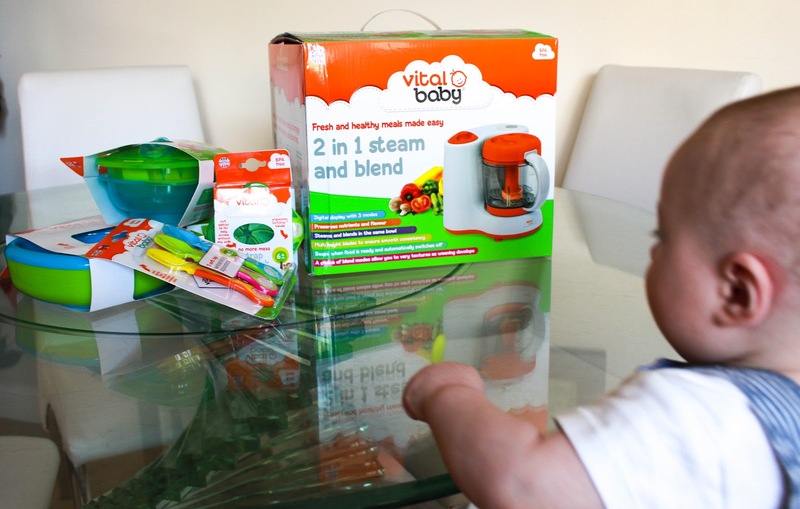 The Vital Baby Steam and Blend is perfect for those of us who are looking for the quick fixes to daily parenting: those of us who forget to buy our pouches or who don't have the time to dedicate to sweating over mashed sweet potato and banana. Don't get me wrong, pouches are convenient, and I will never rely solely on purees alone - Ella's Kitchen is just as good as whatever I can come up with at home, but I now have the choice to do both. 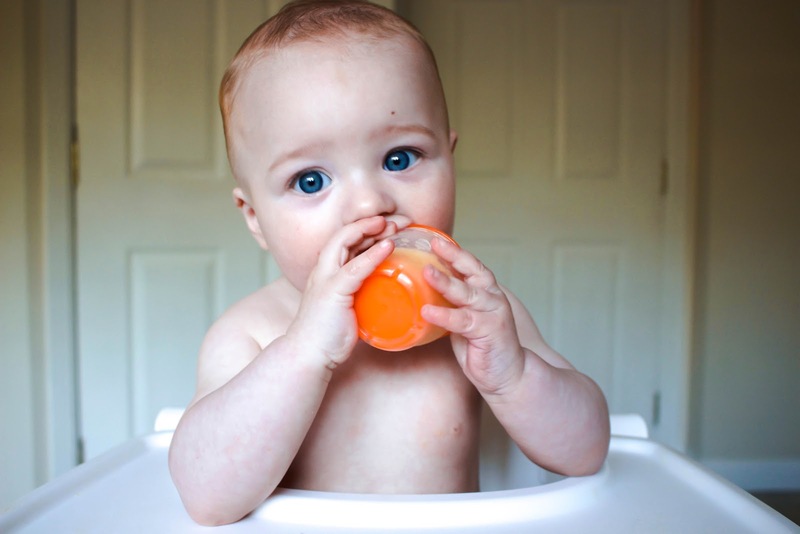 My Vital Baby S&B is my quick fix, and my go to weaning aid. Parenting can be stressful, and if a steam/blender combo can take a little bit of stress out of my week, and give me an extra few pounds at the end of the month, I'm all for it. Right now, the S&B is out of stock from Vital Baby direct, which speaks volumes for the quality of it. It can be found here on Amazon for £49.99.